Socrates said: My advice to you is to get married: if you find a good wife you’ll be happy; if not, you’ll become a philosopher. Ouch. One of history’s first really good burns. Because he WAS married. Her name was Xanthippe and she was quite a bit younger than our Philosopher King. We don’t know that much about her. (Hardly surprising since all the history books were being written by men). 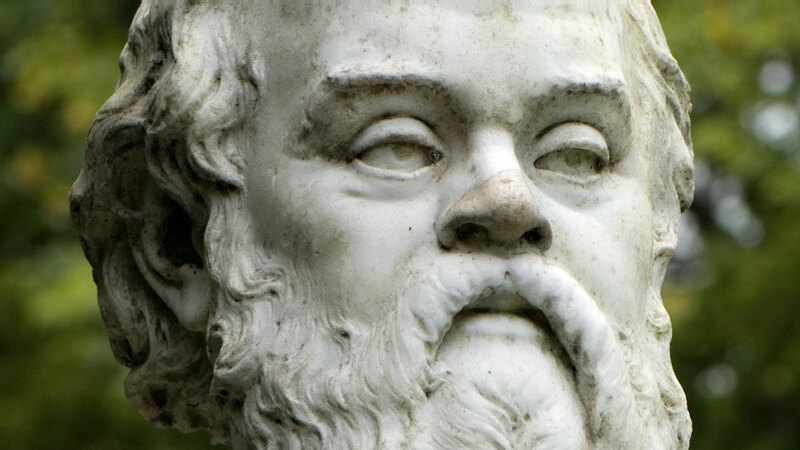 An ancient historian had listed her as ‘undesirable’ and Socrates was obviously not ‘happy’. She gave him three sons. And he wasn’t happy? Isn't that what every ancient Greek man wanted? A stout woman to bear him sons? Socrates might have been wise but he was kind of a jerk too. Yeah. I said that. What did you imagine when you imagined being married? (I’m assuming not just having a stout woman to bear you sons). Although, no judgement in this space…. I imagined having someone you not only love to spend your life with (doesn’t love wax and wane?) but someone you really, actually, genuinely, warts and all LIKE. Someone who makes you laugh. Someone you wouldn’t mind being stuck on a deserted island with. When I imagined being married I imagined lots of wonderful and silly things that have come true, and some we’re still working on. Anywhoo….I know when I’ve had a particularly convincing argument when, days later, long after the fire from the debate has cooled, I find myself fighting from his previous position. Yes. Except, maybe because after a few days I concede his point maybe had a modicum of credibility and that’s when he switches sides and argues my previous point for me. Usually better than I did. I’d like to blame it all on HIM, he’s so argumentative! And he is, for sure. But I seem to remember a certain little girl who loved to argue anyone, anytime, about anything. Poor Ellie. Well, she’ll always hear both sides of the story with us, usually twice. This may surprise some of you. I am after all the organic-tofu-eating yoga-addicted waaaaaay-far-left-mother-earth-diva kinda lady. I literally will not hurt a fly. Let’s be clear - I don’t want guns ANYWHERE NEAR MY HOUSE. I’m scared I’m not cutting Ellie's GRAPES small enough and I’d let a DEATH MACHINE in my house? No. All that to say this: I don’t have anything against guns. But this country is SICK IN THE HEAD if it thinks 353 mass shootings (four or more people killed at one time) in 340 days time is ANYTHING close to normal. Or SANE. If this country were a person he’d be labeled a psychotic and locked far, far away from civilized society. It isn’t that the US has more guns than people that alarms me. It IS part of this culture after all, for better or worse (lately, worse). What alarms me is the complete inability to pass any sort of gun safety laws in this country. These laws aren’t in place to take guns away from people. They’re there to ensure the wrong people don’t get their hands on them in the first place. Every time I hear someone say ‘criminals don’t pay attention to laws’ I want to cry. You just have to look at Canada, or Australia, or ANY OTHER FIRST WORLD COUNTRY to see that they DO work. It makes me want to cry because there’s no thought or effort behind that sort of comment. It’s a deflection. And a stalling tactic. It’s just plain not true and it’s literally costing lives. Every day. We. Need. Better. Gun. Laws. A license is required to own or possess firearms. Federal government safety course required before applying for a license. To be authorized to carry a handgun or restricted long gun for a lawful occupational purpose, such as trapping or working in a wilderness area, an individual must be a Canadian resident, have a firearms license with restricted privileges and obtain an Authorization to Transport permit. These laws are common sense, practical, and they work. I won’t demonize the NRA - they are what they are. We’re not mad enough about the issue to try and make any real changes. Well, I’m mad. I don’t want to wait until I hear a phone call from Ellie, hiding under her desk because someone is there trying to kill as many people as they can before they die. THIS is the use automatic weapons were MADE FOR. To kill as many people as possible in as short a time as possible. Surely even in Texas we can agree we don’t need an automatic weapon to hunt, and what skill does it take to hit a target with a semi-automatic rifle? What other argument is there? If you’re stockpiling for the zombie apocalypse rest assured it’s already happened. What other explanation is there for the lack of movement on this issue in Congress except that they’re all already dead inside? What did you do with my Angie - my daughter - who will pick up a spider and carry it outdoors? You are going to learn to fire a weapon??! !